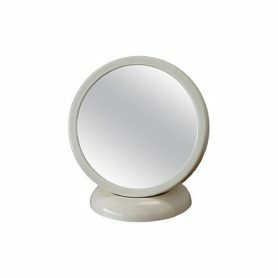 The 60s table mirror designed by Filippo Panseca is a modern design complement with an essential shape. This complement adapts to any style thanks to its neutral color and the simple shape. Perfect to be placed on a bookcase, on a table or on a shelf. Filippo Panseca was an artist who collaborated with various brands such as Kartell, Onlywood, Martini, Arteluce, Fiorucci and Baghetti.